Critical to the College of Veterinary Medicine’s role in providing a high quality education is a dependence upon a robust and reliable computing infrastructure. Access to a wealth of current, accurate information along with an assortment of useful software applications is readily available to students, staff and faculty. In this document we have attempted to compile a complete collection of pertinent information regarding computing at the CVM. Please familiarize yourself with this document and keep it handy for future reference! The CVM Community as part of the University must follow all policies regulations and rules (PRRs) set forth by the university. Throughout your career with CVM important information will be sent to you via email. It is your responsibility to read and respond to your email in a timely fashion. Failure to do so will result in missed information! As an NC State University student, you now have a Unity email account. 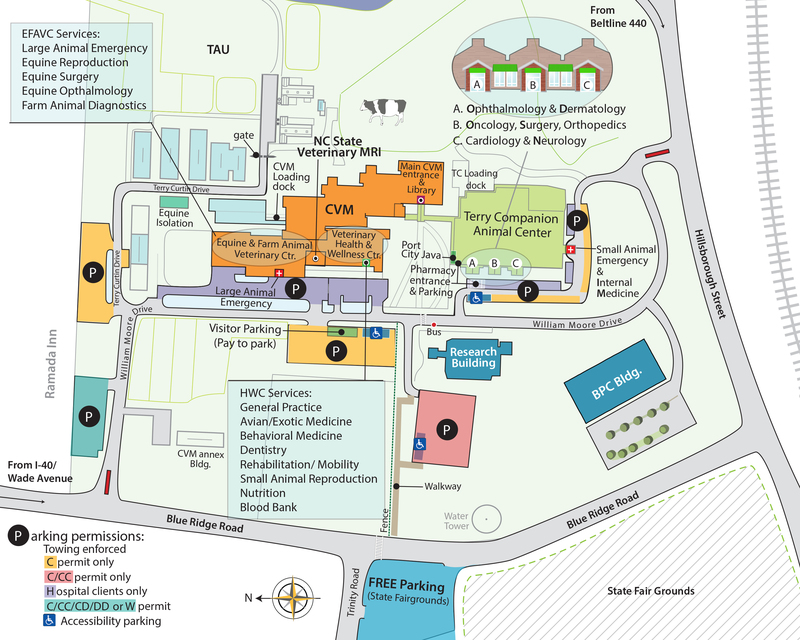 This address takes the form of “unityid@ncsu.edu.” Official CVM business will only be sent to your Unity email account. If you do not intend to use your Unity email account, you will need to configure email forwarding within NCSU GMail account settings to assure that your Unity email will be forwarded to the email provider you intend to use. Remember to update this information should you change internet service providers. Gmail is the official email provider for all NC State students, faculty, and staff. You may use NC State’s Gmail service (http://gmail.ncsu.edu) at any time and from any location with a web browser and internet access. Email List use is subject to the NC State University rules and regulations of broadcast email (8.00.2 regulation). Please use lists for professional matters only. You are urged to avoid using the lists unless you are trying to communicate vital information to the entire CVM or certain CVM groups. Please communicate directly with individuals (faculty, staff, or friends) and make your own address book entries for frequent email partners. Email lists are not to be used for advertising such as for roommates, pet adoptions or items for sale. The CVM Classified Advertising website (https://webapps.cvm.ncsu.edu/academicaffairs/classifieds/) is available for those purposes. A current summary of primary CVM mailing lists may be found on the Computing Resources website (CVM Email Lists – Internal). If multiple people need to respond to incoming email please consider setting up a generic email (Google generic ) account. You should request generic account creation from CVM Computing Resources so that we can assist you with account creation and yearly maintenance renewals/ownership changes. While sometimes bothersome to create or enter, passwords are the primary method of preserving a secure computing environment. Your Unity account has been created with a default password. As soon as possible, change your password via the NC State “Change Passwords” page (http://www.ncsu.edu/passwords). A good password is difficult to guess and combines both alpha and numeric characters, along with punctuation. A common technique takes the first or last letter of each in a saying or phrase familiar to the user. For example, by using random capitalization and substituting some punctuation marks and digits for letters, “Friends don’t let friends give tech advice” might become “fD!Fg7a.” Don’t use your address, birthday or spouse’s/pet’s name and please don’t use the example just given. Do not give out your Unity Password and remember, NC State will never asks for Unity passwords via email. If you receive a suspicious email with an attachment or odd links, do not open the attachment or immediately click on the link(s) until you verify that the sender and links are valid. There are many phishing scams involving emails that appear official (w/ standard organizational headers or signature blocks) that include weblinks that redirect the user to malicious websites in an attempt to collect personal information—do not fall victim to these scams. Scan all removable media (flash memory and key drives) with an up-to-date endpoint security application (e.g., Symantec, McAfee, Microsoft System Center Endpoint Protection, etc.). NC State provides standard antivirus protection for all NCSU-owned systems. For personal computer systems, you will need to purchase a compatible endpoint security solution. Additional information is available at http://oit.ncsu.edu/antivirus. CVM Computing Resources can provide certain software to all CVM computers in the Wolftech Active Directory domain. A lot of this software can be distributed and installed remotely overnight. CVM and the University have site licenses and/or reduced –price purchasing agreements for a lot of software so please check with Computing Resources for remote installation or the available software site at http://software.ncsu.edu. CVM Computing Resources requires all computer and printer purchases be approved by Computing Resources staff. Dell is the CVM-approved vendor for desktops and laptops. Quotes are based on the CPI-approved Dell models in the online MarketPlace. The University initiated the Combined Pricing Initiative (CPI) in May, 2010 which requires NC State, like all schools in the UNC system, to participate in the program. Apple computer purchases likewise must be approved by Computing Resources staff and quotes provided based on MarketPlace Apple Education pricing. Please contact Computing Resources before making printer purchases to avoid known compatibility issues with operating systems and network concerns. Preferred brands for Windows-based computers are HP and Okidata.